Virtually every popular online casino today has grasped the opportunity to offer its casino games for mobile play through mobile apps or mobile sites. This is one of the best ways to get closer to their customers without limiting them to using only their desktop computers in order to play casino games. 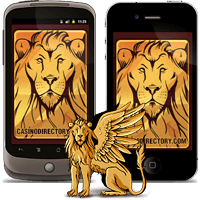 Today, when almost everybody owns a decent Smartphone or tablet, enjoying online casino action has never been easier. Just connect to the internet, visit your preferred mobile casino and play your favorite games on the go. Mobile casinos are offered via mobile apps and mobile sites. Mobile apps are the best way to enjoy playing casino games if you own a Smartphone or a tablet. Mobile sites on the other hand are intended for any older device that doesn't fall in the Smartphone category. This essentially means a mobile device that doesn't run on any of the operating systems used for Smartphones, but one that can be used for surfing on the Internet. There is no doubt that mobile gambling is taking over the industry more and more, as people continually search for convenient ways to perform their desired activities, and today more Smartphones are sold than computers. The beauty in mobile casinos is in the versatility of mobile apps that online casinos offer. All you need is an iPhone, Android, or Blackberry Smartphone (and recently Windows), and you are all set. Tablets are included too, like iPads or any standard tablet running on Android or Windows. There are currently over 300 casino games for iPads. The iPad casino apps are easy to use, and contain the best graphics & selection of games. Android is one of the most popular devices for mobile gaming today. The apps are very easy to download. See which casinos will work on Androids. Discover casinos compatible with Blackberry OS, how to play, how to make deposits, withdraw winnings and more. Your favorite casino games can be played for free or real money on your iPhone. The casinos listed here are 100% compatible with iOS. Playing on your tablets provides flexibility which desktop computers won't give you, and better screen size and overall player experience that some mobile phones lack. Check out the top rated online casinos for tablets here. Supports all major OS like iOS and Android. See our complete guide of online casinos and casino games that will work on Windows OS mobile phones. Find exclusive bonuses and promotions. What is the difference between a mobile casino and PC casino? Although mobile casinos tend to offer all the essential functions and services that are necessary for players to properly use the casino, they have only a limited number of games, as opposed with a PC casino. This is because not all games are optimized for mobile play. However, you can still make deposits or withdrawals and do other stuff. Can I play any casino game on my mobile? Technically, you can, but not all games are offered. As mentioned above, in general only the most popular slots, blackjack, roulette, poker, progressives, video poker and even live dealer games can be found on mobile casinos, but it’s not likely that you will have the entire library of games as on the PC casino. Will I receive a welcome bonus if I play on my mobile? Some casinos offer the same welcome bonus as on their PC version or they tend to give a separate special mobile bonus, usually a small no deposit bonus of up to $/€/£20 just for trying the mobile casino for the first time. Are mobile gambling applications really safe? Yes. Online casinos offer their mobile gambling applications with the latest security measures with which all personal sensitive data and financial transactions are protected. Furthermore, if the PC counterpart of the same mobile casino uses software from renowned software provider, you can rest assured that the same software provider is used to power the mobile casino. Can I use my regular computer casino account for mobile too? Again, yes. There is no need to create separate mobile casino account. Just use the same username and password as you would for the PC casino. So, you own a Smartphone or table and now you want to gamble with it. First thing to do is the same as when searching for a PC casino, you will need to read reviews and recommendations as to which mobile casino offers the best performance and the best selection of games. After that, make sure that the casino accepts players from your country. If you have a Blackberry, check if the casino has a Blackberry gambling app that you can use. The same goes for other operating systems, but we are sure that the casino has an app for iPhone or Android. Alternatively, if you don't have a Smartphone, check if the online casino offers a mobile casino site. This might be important to some players, but it's not a big deal if there isn't any. If the mobile casino has a bad reputation, fails to offer security measures and all the necessary functions to have an enjoyable mobile casino experience, the welcome bonus is useless. This is the final step that you will make after going through the first 3 steps. Sign-up and enjoy playing mobile casino games from anywhere you'd like. Getting the welcome bonus for mobile play is essentially the same as for PC play. The process usually involves making a deposit via your mobile (if it's a first deposit bonus) and your deposit will be matched. Alternatively, you may need to use a certain promo code to activate the bonus, which is done through the mobile cashier. If there is a mobile no deposit bonus, the bonus will be credited to your account automatically. No deposit bonuses can be free spins too. Big software providers like Microgaming, Playtech or other have almost identical performances of their apps. There is no essential difference since they all invest a lot in their apps that online casinos offer for mobile gambling. The only difference that can be crucial is if they offer apps for all the different Smartphones today. For example, a lesser software provider may not have developed a mobile gambling app for Blackberry, so Blackberry users will be left out in the cold and will need to either use the mobile site or the PC version of the casino. Another difference is the number of games that the software provider has optimized for mobile play. Microgaming, for example, has over 40 titles available for mobile gambling. On the other hand, Playtech is the only provider with live dealer games for mobile play.